For the latest news, new work for sale, exhibitions and offers, please follow Tim on Twitter. You can also see sketches, completed commissions, progress shots of paintings from start to finish and rare research photographs. Tim's first exhibition of 2017 was held at Retromobile in Paris. A beautiful event as always with some stunning vehicles on display - one to visit if you've not attended before. Then it was off to Goodwood 75th Members Meeting in March. Despite it being rather cold, it once again proved to be an event not to be missed with an incredible line up of cars, drivers and races. The next exhibition was at Pebble Beach Retro Auto at Spanish Bay lodge, California USA in August and then Goodwood Revival, Goodwood, UK - September 8-10. Please follow announcements on the twitter feed for new work and upcoming exhibitions. 'I'll have what he's having' is now available to purchase as a Limited Edition of just 150 signed and numbered prints. 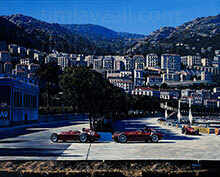 It depicts works Ferrari drivers Peter Collins and Juan Manuel Fangio at the 1956 Monaco Grand Prix. If you would like a certain number, perhaps to match an existing print that you have, this may be possible, please ask for availability. Being such a short edition, it is expected to sell out quite quickly and become highly collectable. As the new boy at Ferrari in 1956, Peter Collins was teamed with the Italian hot shoe, Eugenio Castellotti and established maestro Juan Manuel Fangio. Collins quickly established himself as a favourite of Enzo Ferrari while Fangio endured an unhappy single season with the Scuderia. At Monaco, in spite of starting from pole position and setting fastest lap, Fangio in car 20 had an uncharacteristically untidy race, hitting straw bales and damaging his car early in the race before hitting a wall and bending a wheel on lap 32. When Collins pitted at half distance, he handed his car over to his teammate who chased the victorious Stirling Moss in vain, the Ferrari pair sharing second place in car 26 while Fangio also took a share of 4th place after his car was taken over by Castellotti. Simple, isn’t it? Following on from a sell out Goodwood exhibition where all available original paintings were sold, we have now moved house. Please note that our new contact telephone number is +44 (0) 1275 235603. 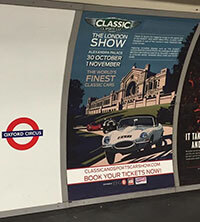 Tim will be exhibiting at the Classic and Sports Car London show at Alexandra Palace, London on 30th October - 1st November. Tim was asked to paint the poster image for the event and it can now be seen in a variety of places. This includes multiple magazines and national newspapers but also in many London Tube stations. Following on from exhibiting at Goodwood 73rd Members Meeting in March, Tim was once again asked to paint one of the official Pebble Beach Posters for 2015. 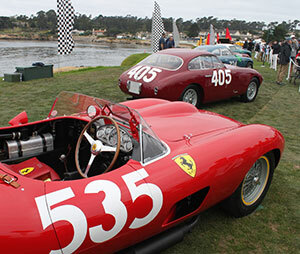 This year it features the stunning Cunningham Cars driving along around the roads near the Inn at Spanish Bay. There should be some signed posters available in September. This year has been extremely busy, with many commissions to paint for private and corporate customers. 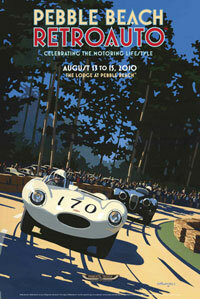 The next exhibition will be Goodwood Revival and then the new Classic and Sportscar London Show at Alexandra Palace. Tim is not travelling to Pebble Beach this year, or attending Salon Prive due to the hopeful arrival of a new baby around that time, not to mention moving house at the same time! These events will be sorely missed but he very much looks forward to returning to them in 2016. Tim is holding a month long exhibition in the Royal Automobile Club in Pall Mall, London starting 29th September 2014. If you are in the area and a member, please feel free to view the work on display in the Hanging Room. Tim has already painted two commissions for the RAC Club and is currently painting two more. 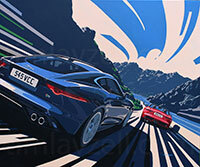 Earlier this year, Jaguar commissioned Tim to paint their new F Type Coupe. The image was to form part of the media launch of the car. Preparation for the project involved Tim visiting the design studio, viewing and photographing the car before any of the World's press got to see it. He then worked closely with designer Ian Callum to create the a composition to show the car off at it's best. The original painting was taken to Spain for the official Media Launch. 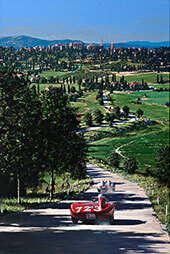 Every journalist from around the globe that went to test the new car in Spain, received a signed and numbered limited edition print of the painting. Tim himself was invited out to drive the car across Catalunya, on many of the roads used for the famous rally stages and lap the Aragon main and handling Circuit to get the very best from the car. You can view a video on the piece here - http://www.youtube.com/watch?v=KLEzYHJwqxg. Following on from exhibiting at Goodwood 72nd Members Meeting in March, Tim then exhibited at Pebble Beach Concours week in August. He was once again asked to paint one of the official Pebble Beach Posters. This year it was to feature the Maserati marque which is celebrating 100 years this year. Posters sold extremely well again at the event, almost selling out. Tim now has a small quantity of signed posters available for purchase on the prints page of this website. After Pebble Beach, it was back to the UK for Salon Prive Concours. Again, a fabulous event where Tim displayed work in the EFG sponsored Art Gallery. With the fine summer weather continuing, it was once again time for Goodwood Revival. Another great year of racing, glamour and period atmosphere. Following a large amount of interest, 'Long Day Ahead' is now available to purchase as a Limited Edition of just 250 prints. It captures one of the greatest drives in the History of Motor Racing - Stirling Moss and Dennis Jenkinson on the 1955 Mille Miglia. As before, if you would like a certain number, perhaps to match an existing print that you have, this may be possible, please ask for availability. 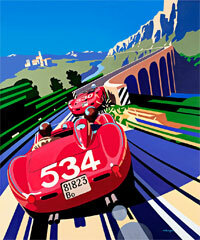 The Mille Miglia was a race in which, even over a very long course, local knowledge counted. In 1955, Stirling Moss was the 3rd - and last - non-Italian to win the 1,000 mile epic in its 30 year history. Stirling was assisted in his efforts by the speed and stamina of the Mercedes-Benz 300SLR and the cool head of his navigator, bearded Journalist denis Jenkinson who had plotted the natural hazards of 1,000 miles of Italian roads onto a roll of paper in a waterproof case, which he communicated to Moss via a series of hand signals. The British pair did not have it all their own way and in the early stages, as shown here, they were harried by the Ferrari 121LM of Eugenio Castellotti as the race charged from town to town through the Italian landscape. Castellotti's matinee idol looks belied a steely determination and skill behind the wheel which made him the darling of the Italian fans. Although very fast, his Ferrari ate its rear tyres at an alarming rate, allowing Moss to ease clear and win at record speed. A year later, Mercedes having retired from motor racing, Moss and Jenkinson crashed out in their Maserati while Castellotti won a very wet Mille Miglia. With the original selling within a day of completion, 'Carrera takes Targa' is now available as a limited edition Giclee print. It is printed the same image height as 'Snakes and Ladders and 'Last Great Road Race' and therefore will look superb as a set. As before, if you would like a certain number, perhaps to match an existing print that you have, this may be possible, please ask for availability. With a lap distance of 45 miles, the Madonie circuit which played host to the Targa Florio provided an even greater test of man and machine than the mighty Nurburgring. Held on closed public roads on the island of Sicily, the Targa Florio was a mainstay of the World Sportscar Championship in its various guises through the 50s and 60s. Its status meant that sports prototypes such as the mighty Ferrari 312PB of fastest qualifiers Arturo Merzario and local hero Nino Vaccarella did battle with the twists and turns of this sinuous circuit but with a record average speed of just 80 miles per hour, agility and handling was more important than straight line speed. In 1973, when the faster prototypes dropped out through unreliability, the 911 Carrera RSR of Herbert Muller and Gijs van Lennep took outright victory. This year has been very busy with exhibitions starting at Silverstone Classic. Some great racing to watch with a nice 'race meeting' atmosphere without the frills. 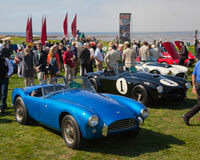 We then moved on to sunny California and Pebble Beach Concours. This year we travelled up to Lake Tahoe for the Classic Wooden Boat Concours which was fabulous. Lake Tahoe is incredibly beautiful with lots of wakeboarding, water skiing, sailing and walking. Pebble Beach was then fantastic as always with the week taken up by seeing extremely rare cars, cocktail parties, signing posters and an exhibition at Pebble Beach Retro Auto. With just 10 days to recover from jet lag, Salon Prive was next. A lovely relaxed atmosphere with lobster champagne Lunch and beautiful cloud free weather on the Wednesday and Thursday. Then lastly, Goodwood Revival. Despite gloomy weather forecasts, the weather was actually largely ok with a bit of drizzle and the occasional heavy downpour creating some superb racing. Highlights were the St.Mary's and Sussex Trophies. There are now a selection of paintings which have been extremely popular but are still available for sale. Please ask for details or visit the Motor Art pages of this website. 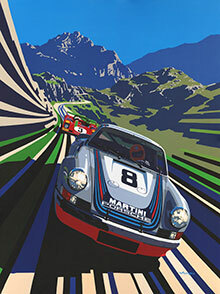 'Carrera takes Targa' was super popular and is now available as a limited edition print. I also now have a few 2013 Pebble Beach posters featuring the Porsche 911 which are also now available on the prints page of this website. Order your Limited Edition Tim Layzell Print Now! Following a huge amount of interest, 'Snakes and Ladders' is now available as a limited edition print. 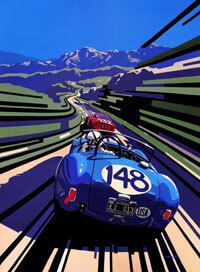 The print is the same height as 'Last Great Road Race' featuring the other great road race, the Targa Florio. As such they make a great pair. If you would like a particular number from the 450 prints, please email or telephone to reserve if still available. Innes Ireland was a racing driver of the Old School. In many ways his racing career came a decade too late, the advancing professionalism of international motor racing leaving little room for the hard drinking, hard driving mentality which pervaded the post-war years and was exemplified by the likes of Hawthorn, Collins and Duncan Hamilton. But while Innes raced mainly for fun - for the hell of it - he was truly a driver of the front rank. A TT and Grand Prix winner, his raw speed and competitive nature saw him drive for many of the top teams of the time, including Shelby American. Here, during the 1964 Targa Florio, Innes wrestles the big, 289 Cobra through the Sicilian mountains in pursuit of the Ferrari GTO of Luigi Mosca and Fortinbras while in the background a Porsche 904 spins. The Cobra was unsuited to the sinuous mountain circuit and Ireland charged to no avail - his Kansan team mate crashing the Cobra through a wall and into retirement. The Ferrari also retired while the race was won by the small, nimble 2 litre Porsche 904 GTS of Pucci and Davis. There's no substitute for cubic inches......? A new event for Tim in 2012 was Salon Privé. Now in its 7th consecutive year, Salon Privé, which returned to Syon Park from the 5th to 7th September, is very firmly established as the UK's most prestigious Super Car Show and the Chubb Insurance Concours d'Elégance is a calendar highlight amongst enthusiasts, collectors and buyers of modern and classic super cars. It is, however, far more than just a car show having also become a permanent fixture on the London social scene. As a fashionable and glamorous Garden Party, it caters as much for motoring enthusiasts as it does guests who simply enjoy soaking up the atmosphere and spending time relaxing against the stunning backdrop of Syon Park. With Pommery Champagne, lobster luncheon, and traditional afternoon tea to add to the experience of an eclectic mix of premium automotive and luxury brands. Tim exhibited his latest work in the inaugural EFG Private Bank Art & Memorabilia Fayre which has become a spectacular new feature within Salon Privé featuring the works of some of the best artists and sculptors from around the world. It's a superb event, quite different to a lot of the other events Tim exhibits at and was blessed with incredible weather over the three day event - perfect for relaxing with a bit of Lobster and Champagne! One of Tim's paintings was used as the cover of the programme for the event and his Limited Edition Prints and Posters were also displayed in the rather grand Entrance tunnel to the event. 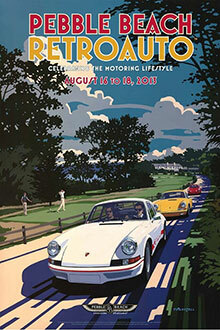 Tim was once again chosen to paint the Poster for Pebble Beach Retro Auto in 2012. 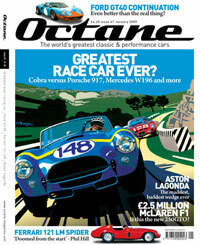 It celebrates the 50th anniversary of the AC (Shelby) Cobram to some, the greatest sports car ever made. The brain child of Carrol Shelby and assembled originally with the expertise and enthusiasm bubbling from the Californian Hot Rod movement, the Cobra was continuously developed and increased in engine capacity during it's short life, it's greatest achievement, winning the 1964 GT Championship using the Ford 289 engine in the low drag Daytona coupe body, vanquishing the reveared Ferrari 250 GTO. Seen here at early morning in the familiar Shelby colours, this Cobra, looked on by the 'Dawn Patrol' crowds, is making it's way on to the field for a showing at the prestigious Pebble Beach Concours D'Elegance. It is followed by a Saoutchik bodied Pagaso Z-102 and a 1913 Mercer 'Raceabout'. Tim’s painting for the Tour poster was sold to the highest bidder at the Pebble Beach Auctions presented by Gooding & Company for $18000 on Sunday, August 19 - the proceeds of which were donated to the Pebble Beach Foundation for Children's charities. The sound of bagpipes rang out around Woodcote Park when Club steward and three time World Champion, Sir Jackie Stewart, roared down the Captain’s Drive in a 1969 Matra; the car he drove to six out of his 11 Grands Prix victories between 1969 and 1970. Club Chairman, Tom Purves, unveiled the painting at a lunch held in the Boston Room, in Sir Jackie’s honour. Sir Jackie took the Matra for a ‘spin’ around the Fountain and up the Captain’s Drive before heading back down to the applause of the crowd. Despite its small size the car still made an impressive noise - after a few revs from Sir Jackie she even managed to drown out the bagpipes. It really was a Woodcote moment of motoring history. As part of the Queen's Jubilee celebrations, eBay hosted an auction of specially created self-portraits by over 40 celebrities and sports legends. Amongst those who took part are Adele, Sir Michael Caine, Brian Eno, Brian Ferry, Felicity Kendal, Sir Geoff Hurst, Sir Stirling Moss - with Tim Layzell, Jenson Button, Richard E. Grant, Michael Morpurgo, Jamie Oliver, Sir Cliff Richard, Alan Rickman and The Wanted. Tim worked with Sir Stirling to create an image of one of his favourite acheivements in his career. Sir Stirling chose the 1955 Mille Miglia driving the mighty Mercedes 300SLR which he won at a record average speed of 97.96mph in a time of 10h 07min 48s over the 1000 mile course. Sir Stirling is shown sat in the car early moring before the start of the race, waiting to be joined by his team mate and navigator Dennis Jenkinson. The Painting, sized 12" x 12" sold for £1700. Proceeds from the auction supported The Prince’s Foundation for Children & the Arts, an educational charity established by HRH The Prince of Wales to enable disadvantaged young people to access and engage with professional arts. The celebrity contributors joined over 230,000 children and teenagers across the UK whose self-portraits were projected onto Buckingham Palace for 3 nights on 19th April. 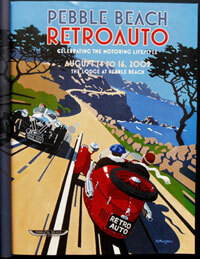 Tim has again been commissioned to paint the Pebble Beach Retro Auto Poster for 2011. It depicts the Stutz Bearcat which is a featured marque at this years event. In the Background is the famous Pebble Beach Club house. Tim will be taking a selection of paintings over to California for the spectacular Monetery Auto Week, exhibiting at Monterey Automobilia and Pebble Beach Retro Auto at the legendary Concours. If you haven't been to these events, make the trip, it is a must do for vintage and historic car fans. 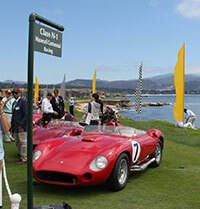 This year's concours will feature the Ferrari 250 GTO among others with over 20 of the 36 made on display. Other events in the week include major automobile auctions from Gooding & Co, Bonhams and RM and the Historic races at the spectacular Laguna Seca track. 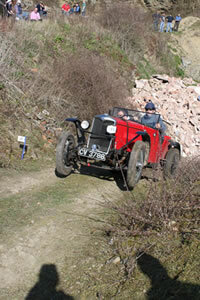 Tim has recently been competing in VSCC trials in his 1930 Riley 9 Special. After quite a few reliablity problems Tim, partnered by his brother Jonathan won some silverware by finishing 2nd in class on the Cotswold Trial at the end of 2010. Reliabilty issues meant that for a second year running they failed to start the Exmoor Fringe Trial 2011. The Herefordshire Trial in March 2011 was subject to some amazing weather and smooth running for team Layzell. However, after a few mistakes in what proved to be an ultra competitive and close event due to the dry conditions, there were no awards this time out. With a busy summer of exhibitions for 2011, it's time to rest the the car and prepare for the Winter 2011/12 events..
Tim has been commissioned by the Royal Automobile Club to paint two new paintings to hang in their prestigious Pall Mall residence. The first depicts Sir Jackie Stewart in battle with Jochen Rindt in the British Grand Prix at Silverstone 1969. 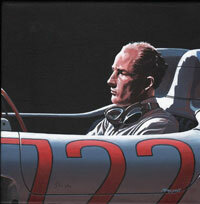 The second will show Sir Stirling Moss driving the famous 722 Mercedes on his way to prehaps his greatest victory in the 1955 Mille Miglia..
Tim was commissioned by Pebble Beach Company to paint their 2010 Poster. It features the first and last Jaguars to have raced in the Pebble Beach Road Races and are captured amongst the Monterey Pines that lined the original road circuit. 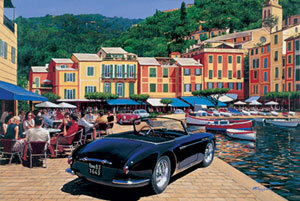 Phil Hill bought the black XK120 and had it shipped over to the US for his own use. He lightened the alloy bodied car by a further 400lbs and won the very first Pebble Beach Road Race on November 4th, 1950. It was Jaguar's first race win on American Soil. 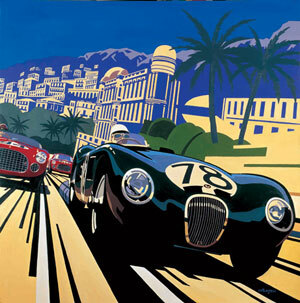 The D-Type (XKD528) in the painting was entered by West Coast Jaguar distributor Charles Hornburg, driven by Pearce Woods in the races in 1956. 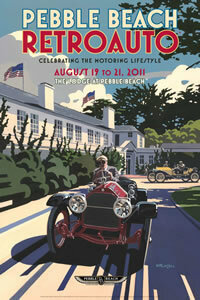 The image was used to advertise the Retro Auto part of the legendary Pebble Beach Concours d'Elegance event held on 13-15 August. Tim signed posters for those visiting the event over the weekend. The original painting was sold for $27,500 by Gooding & Company on Sunday 15th August - It was the only item in the two day Auction that was not a car. The proceeds were donated towards the Pebble Beach Company Foundation which supports many local charities in Monterey County. Reserve your Limited Edition Tim Layzell Print Now! Peter Collins hurls his Ferrari 335S into a slide in pursuit of Giorgio Scarlatti's Maserati 300S as they both forge across the Abruzzi Mountains during the 1957 Mille Miglia. Collins set a searing pace, and by the time he reached the half way point at Rome, looked all set to break Stirling Moss' course record. However, a broken differential near Bologna - just 200miles from the finish - handed victory to Piero Taruffi in this, the last running of the Mille Miglia. Limited to just 450 prints, each are signed and numbered by Tim. For Christmas 2008 Tim was commissioned by Octane magazine to paint a Cobra in action to be used on the cover of their January 2009 issue. The image proved hugely popular and resulted in them producing a signed Limited Edition of 100 Prints. The Cobra was being featured as part of their 'Greatest Race Car Ever?' series which also included the mighty Porsche 917, Mercedes W196 among others. 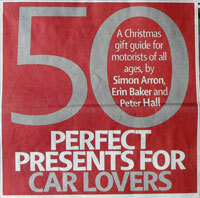 The Telegraph Newspaper's Motoring section on 29 November 2008 included two of Tim's prints in their '50 Perfect Presents for Car Lovers'. Limited Edition prints 'Full Bodied Grand Prix' and 'Portofino' featured among a mixed bag of other gift ideas including trackdays, calenders and car covers. In addition to these features, Tim has also recently been featured in Classic and Sports Car magazine, Motorsport magazine and Performance Car. Reserve your Limited Edition Tim Layzell Prints Now! In 1952 the Monaco Grand Prix – at this time not a regular event on the World Championship calendar was run for sports cars over 2 litres. Here, the Jaguar C Type of Stirling Moss is pursued by Vittorio Marzotto’s Ferrari 225S up the hill to Casino Square. Moss was later eliminated in a multiple shunt which caused several cars to retire while Marzotto steered clear of trouble and went on to win. When clothed by the leading Italian Carrozeria – as here by Frua - Maserati ‘s A6G was among the most beautiful road cars of all time – the ideal mount for a trip to the north western fishing village and fashionable tourist destination, Portofino. The premise of GT racing was that manufacturers could race cars based – however loosely – on cars which customers could drive on the road. The Ferrari GTO and the Aston Martin Project Cars were perhaps the ultimate expressions of this – based on the 250GT series and DB4GT respectively. For the TT at Goodwood in 1963, the Astons of Bruce McLaren and Innes Ireland were handicapped by having to run on narrow 5 ½ “ wheel rims. Although Ireland put in a banzai qualifying lap to take pole, Graham Hill won the race from Mike Parkes’ similar car while Ireland finished 7th after a number of lurid spins. Here, Hill leads Ireland and Parkes out of the chicane in the early stages of the race. Image size 62cm x 50cm Approx plus large border to give some framing options. 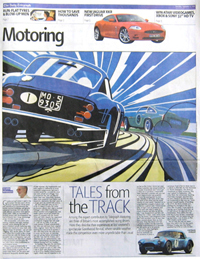 Tim's painting of the 1960 Goodwood TT received high-profile exposure as part of the Daily Telegraph's recent coverage of the Goodwood Revival meeting. 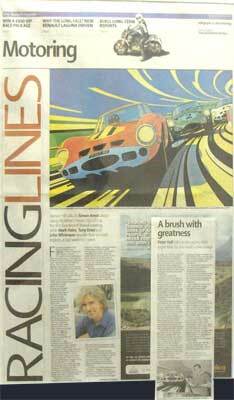 The painting, which is available as a limited edition print, was used as the main cover image in the Motoring section. Following the popularity of the original painting during the summer months, Tim is releasing 'Into the Light’ as a Limited Edition print. 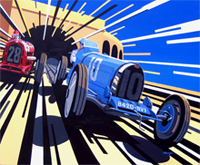 ‘Into the light' depicts Achille Varzi in his light blue Bugatti Type 51 and Tazio Nuvolari in the Alfa Romeo 8C-2300 blasting out of the famous tunnel at the 1933 Monaco Grand Prix. They are dicing for victory in one of the all time great racing battles! After passing and re-passing each other many times throughout the race, Nuvolari’s engine eventually blew, leaving Varzi to take one of his greatest victories.